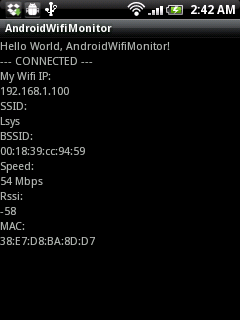 Last exercise show how to "Get Wifi IP using WifiManager". This exercise it will be further extended to monitor Wifi Connectivity status, and show more information also; such as SSID, BSSID, Speed, Rssi and MAC address. In order to monitor the Wifi Connectivity status, we have to implement a BroadcastReceiver to receive "ConnectivityManager.CONNECTIVITY_ACTION" intent. Modify AndroidManifest.xml to add permission of ACCESS_WIFI_STATE and ACCESS_NETWORK_STATE. This exercise, the app "Monitor Wifi status and information with BroadcastReceiver" by monitoring of ConnectivityManager.CONNECTIVITY_ACTION, it will be broadcasted when change in network connectivity has occurred; connection has either been established or lost. In case of RSSI change will not trigger the event. To detect RSSI change, refer to another article "Check RSSI by monitoring of WifiManager.RSSI_CHANGED_ACTION". Thanks... Can you show how do it with get the connection speed via mobile instead of wifi? i have developd an app which will geive the details of the network to which it is connected.But when the station is changing automatically from one AP to other AP with same SSID(roaming scenario) then how to detect the BSSID of the changed network automatically.Any API or Broadcast receiver info will be helpful. Check via NetworkInfo for wifi-type if it is connected. It will help you with your task.